The morning of September 4, the Greif colleagues from Zhytomyr, Ukraine hit the streets together to run in the local Space half-marathon. The multi-departmental team, organized and led by Anna Sinelnikova (Administration), included Svitlana Yakymova (Finance), Maryna Bei (HR), Yurii Melnytskyi (IT), Yurii Lugovskyi (Legal), Vitalii Morozov (Planning), and Andrii Gryshchuk (Logistics). The team feels strongly that following a healthy lifestyle is one of the best things you can do to improve your quality of life, which is why these seven employees decided to take part in this race. For several of the team members, this was the first time they had either entered a race or ran in a marathon. 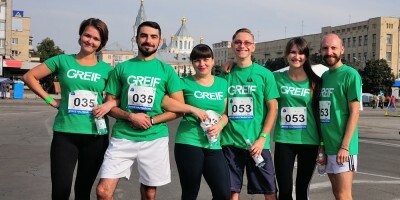 Members of the Greif team ran multiple different distances of 5 km and 2,48 km and their children joined the distances of 317 m and 100 m. While the main goal of the team was just to participate, the team did exceptionally well – delivering the 9th best time among the 50 corporate teams and 5th among the women’s competition. Anna inspired and organized the team, encouraging each and every member to sign up for the event. As the Greif Space half-marathon team lead, she also coached them to undertake serious training for the month prior to the race. The route led through the central and historical areas of the city giving the team an opportunity to see the city from a new point of view. This is the same approach they can apply to the working process in Greif. It is important, especially for the younger generations, to have an opportunity to develop themselves by overcoming challenges, and performing on new and complicated projects. On race day, Greif colleagues came out to cheer them on. This is the Greif Way, to work together and achieve positive results as a team and taking extra steps to support and challenge each other to do more.